Because of the very technical nature of the Iaido curriculum, only after students become familiar with the fundamentals of the Aikido sword, may they request permission to join the Iaido class. 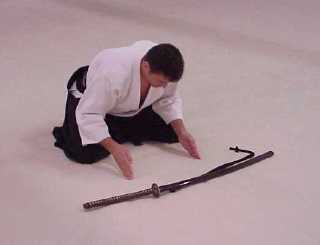 Iaido, the Art of Drawing the Sword, is an art separate from Aikido. However, because Aikido is based upon sword and stick movements, many Aikido schools incorporate some degree of Iaido training. Sensei Herve Rouxel, 6th Dan, began his Aikido and Iaido training while growing up in France. On his numerous trips to Japan, Rouxel Sensei continues to train in both Aikido and Iaido.